Hi Mr Wigington, this is Herbie Corrigan from Moncton, New Brunswick. I just like yourself, have been doing research for the past three years, and listening to Alex Jones and looking at the skies and trying to warn people, and they would look at you, as if i had two heads, you can understand that. Please direct me in how, i can do this without instilling fear in them to get other people awoke. Thank You! Herbie. Dane , I was pleased to see the new Geoengineering Billboard on the I-25 between Santa Fe and Albuquerque. More awareness is the key to getting more traction on this. Had three beautiful sunny days here in Victoria BC Canada, and then back to the all out climate engineering assault. So discouraging. How could this be allowed to continue? Do those that are perpetrating this crime against all life have hearts and minds? Do they have children? Yes the power structure is becoming desperate. Seems they are willing to sacrifice all life to fulfill their ends. Total insanity. It boggles the mind. Demonic forces? Plain old psychopaths? We must unite to expose this crime against earth! Fortunately my family members and some of my friends are awake to what is happening, and word is spreading. I have no choice as a human being to sound the alarm. Here’s to the awakening, and I. pray it’s not too late. Also thank you Dane so much for this site and all your courageous work!!! There seems to be a lot of conflicting commentary throughout all media about Carbon Dioxide (CO2), taught in the 4th grade in my day (1950's), is the life-blood of plant life (mammals breath it out, plants breath it in, which generates oxygen for us!) When I come across comments throughout media demonizing CO2 in the atmosphere (as if it's a bad thing), I become a bit confused. I think the whole subject of CO2 should be fully discussed & clarified, here, since this issue appears to be just one more subject in which reality has been fully inverted (as have all aspects of our reality). Dane, most of the time I wonder about the things I notice, but in this video one thing I have to thank you for is confirming what I have noticed off the west coast of the Sunshine State (via satellite) with the re-direction of storms. I had mentioned what I had noticed to some people on a number of occasions but they just looked at me like………man you better get some sleep or where is your white jacket with all the buckles? It's just like when I mention something about the long white trails in the sky, chemtrails, geoengineering or whatever. Their like, huh, wha, hmmm, gee, yeah right, I never noticed or OH! you are one of those. Dane your hard work is very interesting and informative for anybody that has the attention span, curiosity or is just waking up to the fact that something unusual is going on. Thanks. I have to say that this site gives me more gut feelings that I'm hearing and reading the truth of what's physically happening to our world today. You're a hero, Dane. But, even if we stopped spraying, driving, flying, and using electricity, it wouldn't stop us from sinking into the abyss. I'm so sorry that heroism no longer matters. My single goal right now is to bear witness to the destruction WE have done, with the hope that our eternal souls will remember and learn from this. Hello Renders, yes, the horizon does indeed look dark, but do any of us truly know how all will unfold? What factors or allies might there yet be that are on our side which we are even now unaware of? I am very grateful for your support, but I am no hero, only a father that wants his children (and all others) to have a future. It is important that we decide to do the right thing because its the right thing to do. Not because of any gauranteed result or carved in stone happy ending, but because our motive to do the right thing matters in and of itself. Our will cannot be taken from us, NEVER GIVE UP. This choice belongs to us and us alone. Dane, Curiously I wonder about your comment of factors or allies that might yet be on our side that we are unaware of. If there are, it may behoove them or whatever to step up to the plate and put a stop to this destruction of this earth. As I feel even with all the positive input, these random small protest against geo-engineering go pretty much un-noticed by our elected officials and are ineffective. It would take protest like there were against the Vietnam war where 10s of thousands people were involved. But then again, even that didn't put a stop to the war in Vietnam. So, if we have allies that can help or other factors, what do you think they are waiting for or what may the factors be? Hello Lakotah, yes, I am trying my best push potential allies out of the shadows, we don”t have any time to spare. Being fairly new to this site and after reading many articles, how does The Old Farmers Almanac fit into scheduled weather? Many thanks to Dane and all writers/speakers who are explaining and exposing the truth. Awesome interview Dane,I believe this is a crack,as described. I incorporate the subject of geoengineering in conversations with clients daily. Some times only able to plant a seed. This interview is a new tool to continue the push to wake people up,great source of info. Here in central Idaho,I have had (and so have many others),bad head aches,and flue like conditions.We have had a mix of trails,some dissipating quickly,others lasting for hours. Most of the spraying has been going on at night,I believe,because of this heavy gray hays filtering,and obscuring the surrounding mountains. I live in a very small town,with a view for 10 miles north and south,and 40+ east and west. Kind of front row seats to the insane spraying show. I work in a valley 50 miles away,that is where many of the elites have one of there million dollar vacation homes.Not all billionaires are evil,I have met a few take a lot of interest in my geoengineering spill. I use "you've heard of geoengineering haven't you" to not insult there intelligence in starting the conversation. If at all possible I leave them with this web sight info,in hopes it will spur them into doing more research. Having gotten feed back from some of these people of them doing so,I think it works to perk peoples intellect,without negativity. This latest interview,and Danes compassion for this cause sells the truth very effectively. Thank you Dane,and all that are in this fight. Nigel, 38 miles south of you where I am May 1st they were spraying again. I'm sure you saw it today. I was up your way in SF to see Naomi Klein 2 nights ago. She and the new editor of the Guardian were chatting at length about geoengineering and SRM. They nibbled all around the issue. The tenor of their conversation led me to believe that they know what is going on but just did not come out and say it.I believe that it is only a matter of time and the cat is going to be out of the bag. Once the public is made aware that is when the S will HTF. Whoa! Did you guys hear that? It sounded like a dam cracking…Absolutely suburb interview Dane. As we used to say in the Navy, BRAVO ZULU!! So some government employees (climatologists etc.) might speak up once enough members of the public arise to provide cover? To them I say, "Please, grow a backbone." Some of us Average Janes have experienced brutal consequences, ourselves. Be brave, people! Great interview.Here the message was louder and more clear than ever (at least ín my opinion ) . My Thanks to Greg Hunter And Dane for their important work (and public service) for all of us. Many thanks to USA Watchdog for addressing geoengineering, which is destroying/obliterating all flora, fauna, soil, water and air This is issue Number 1 for all biological life. Please help us to continue the work by educating your listeners and asking them to take action by referring to Dane's site for ways in which to help the cause. You are very appreciated. I have not had much success with the CAPTCHA CODE on posting here. Anyways I'll try again, this last week Thursday I went up to Ruidoso, New Mexico for a couple of days. On this day in Southern part of State here we were inundated with much SAG trails and spraying with this crap traveling for over 2 hours worth of driving up there. The pine trees up there look very sad but there was rain on Friday with snow on higher caps of mountains. Down South there was no precipitation for the spraying. While up in this town up in mountains I found out that Bonito Lake which is a watershed for town water was contaminated from fire retardant when forest was burning up there a few months back also killing of all trout fish and ruining all drinking water there for Lord knows how long, very sad situation. The cracks in the dam of secrecy are spreading. Critical mass is an exponential snowball effect and there is now more interest in this subject than ever based on the number of people I have come into contact with who now know. Keep hammering em' folks, I can only imagine that the burst will not be too long from now… Phase one is nearing completion. What comes after is anyone's guess. Thanks again, Dane. Really glad to see you Dane on Greg's show, for a couple reasons. One of course being the exposure to these ongoing programs. And two, after seeing lord Monckton on the show earlier this year with the whole 'global warming fraud' spiel, and now someone that is actually more qualified to talk about global warming, especially in the context of geoengineering, this is just a really good indicator that the truth is prevailing! Thank you Dane and USA Watchdog. Thank you USA Watchdog Greg Hunter. Dane Wigington is a brave and spirited and well-grounded individual who like a General works with only the most reliable data available on the subject of climate engineering. And with the most dedicated scientists. The way he & his group organized a presentation last year before the Shasta County Board of Supervisors was truly motivational. Everyone with any sense of civic responsibility or concern for the future health of ourselves & our planet would do well to work with Dane & his team and with all of the incredible (yet highly credible) information to be found on his site https://www.geoengineeringwatch.org. I just wish more media people would contact Dane for instruction (er, I mean 'interviews'…lol). Thanks again for helping get the word out Greg & Dane! 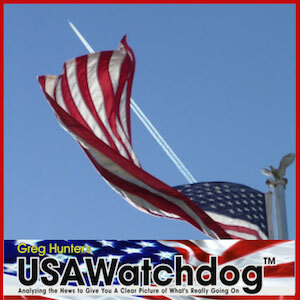 Thanks Greg of USA Watchdog News for this article and interview! And thanks little Rhode Island for being David to this Goliath. Let's get all our states onboard using the RI Geoengineering Act of 2015 as the example of what we want to see from our state representatives. The dominos are falling…let's hope it's not too late. Good one Dane!!! A Very sharp interview, and right to the point. See them here above us in remote SE MT about 3 days out of each week- sometimes can count up to 9 streaks criss-crossed low in the sky, dissipating from the morning throughout the day. I feel so angry and hopeless about it. Seems as if everyone is just oblivious……. Greg Hunter, thank you so much for taking interest in this cause, and conducting such a thoughtful interview with Dane Wigington. You asked very pertinent questions, and because of that, this interview will be a valuable one for people to share with others who are just waking up to this issue. Many thanks. I hope you'll continue to do more in the days ahead. We truly are running out of time, and the more we can reach, the better. TO DANE, What can the average Joe do about this? Yes, we see them in various places. I was in N.C. and I saw them, I went to Fl. for the winter and I saw them there too. I drove thru Ga. and S.C and they're there as well. Now, I'm back in N.C. and I've seen them twice in the past 3 weeks. What can we do about it? Who is in charge? Who's responsible for these planes being in the air and doing this? Is this the P.O.T.U.S. or somebody else? Very toxic skies, very dangerous to humanity and very unhealthy it seems. I have a feeling it affects our health, our heart, our lungs especially, people with asthma and anyone with a repertory disease. I suffer from sinus problems and when they spray it clogs them up worse than usual. I'm sure it's not good for the elderly or babies to breath. What about the animals out in the fields, or the plants and flowers.? It's probably affecting every single living creature and human as well. Hello Wanakate, all of us are needed in this fight and all of us can make an important impact on the outcome. Check the “activist suggestions” link and the “flaming arrow” link on the upper left of the home page on geoengineeringwatch.org. We must reach a critical mass of awareness, there is no other way forward. Thank you Greg Hunter for helping to clear the air (at least verbally) and helping Dane Wigington carry the message. One by one, video by video and interview by interview, the Elephant is getting bigger than the room. When the walls split and fall and everyone see it, all Hell is likely to break out. We can only hope when this happens there is enough time to salvage what is left of our Earth! We all need to hasten this "informational room collapse" by Talking to Everyone, Hammering the Power Structure and The Media with demands of disclosure, accountability and a stop to this destruction. Not long now! I give it 2 months? Lotta millitry waking up to smoke and mirrors! Or I should say evening news! What happened to those Generals, true Americans, that were let go? Many foreign people from other countries can see what is going on! They have many questions, and 1 is they heard that Bruce J. Likes to wear dresses? Also D.W., thanks for that great web site, ricefarmerblogspot.com! Stay medicated and numb till it is to late! American motto? Hard for me to understand why I can see and many others don't? Delusional thinking I've heard! They fly over Sonoma County on an unrelenting schedule. How can we get the word out to people? It seems that people don't look up in the sky and notice. What measures can we take to inform citizens? Billboards? Letters to Gov. Brown? Please, guide the people who do know (but feel helpless) to bring awareness to others that this is happening; and guide us on how to fight back in the most professional, and scientifically educated manner. Lynn. I would think that the big winery's like Galo, or Kendal Jackson who have a lot to loose would be raising hell about the toxins being dumped on those vineyards. Are they just not a collaborative force? I am a honorable discharged veteran and frequent the VA hospitals and clinics. It is deplorable on how the VA administration handles the medical care to veterans. They have had many national investigations of misconduct and derelict of duties in the past. What happens is it gets publicized for a few weeks and they appoint a sacrificial lamb to take the rap. Then the VA system goes back to business as usual and covers there tracks again by erasing data. This is how the power structure covers up all aspects of the Federal abyss. The public thinks the problem has been solved as the MSM reports it to be so. What happens is like the VA it goes back to business as usual and the veterans suffer even more. We as veterans have served our country and fought and many have died or come back to society handicapped physically and mentally. We are treated in the VA as like were a problem to them and just shut up and be thankful for what your getting. Most veterans need medical care and many never get it because the VA never does there job by providing what there supposed to be doing in the first place. We as veterans should be able to go to any medical facility we choose at any time to get proper care. It would be cheaper to abolish all VA medical facilities and let veterans get private health care. They won't do that because the money train would stop and most veterans would get proper care. The whole system is rigged and always has been. At one time I made a comment to my VA doctor that so many of us are getting sick because of geoengineering. He told me I was delusional and he was going to recommend me to see a mental health doctor. I told him no and then he said that I have a trust issue. You bet I have a trust issue and told him to look up at the sky and uncover you eyes. I was recommended to see another VA doctor. I talk to many veterans and they are awake and talking to many others about geoengineering and Jade Helm that threatens us all. The last time is say a VA doctor the nurse asks typical health questions first and on new question was if I owned and guns. They now ask all veterans if they own guns, how covenant and it fits in there agenda. It is really sad Frank, how the military considers those who unselfishly enlist (believing they are serving their country well) simply as expendables and treats those survivors of wars created to serve the intentions of the so called 'power brokers' of the world so badly when they return injured. Thank you and your many military brothers who have served America with the best of intentions. We appreciate your unbelievable sacrifices. I hope many in the military now are waking up to what is really happening. This world has no chance "Unless Peace Comes'. I believe this is a book written by a military man, Gordon J. F. Mc Donald, if memory serves me correctly. Our only hope is that ALL militia around the world REFUSE to pick up armaments and stop killing each other and the rest of the planet. The same is true of those flying the spray missions. They must REFUSE to fly those jets dispersing the poisons. How can one feel proud of poisoning and destroying an entire planet and all the magnificent life forms it once contained? I hope they wake up soon, everything is on its way out. What a sad commentary on the US Military's treatment of our Veterans. I wish this information could be widespread enough to reach those who plan to sign up. The " carrots" they dangle are not enough to make it worth the risks! I wish you all the best going forward. I appreciate your honest caring earth Angel and Cheryl Webber. This is a ongoing fight with the VA just like all aspects of our system. The ongoing onslaught of geoengineering has to be stopped now as the earth can't take anymore and we humans are poisoned everyday. I thank you all and Dane for everything you do. Keep the message going as we are the true saviors. how can i have french flyer for my people here ? im well informed on this subject but i want more to give awarness to the people who live here in Quebec, Canada.